We would all love to be debt free. The first step to getting rid of debt is to learn to live within your means. If you can get a grasp on spending less than you earn, you’ll generate the savings that you need in order to pay off your debt and stay debt-free for life. The following five tricks are among the smartest attitudes and habits that you can adopt to live within your means. Always live one raise behind. 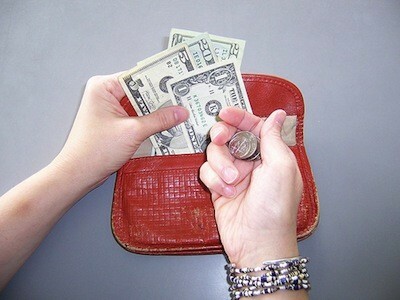 One of the best ways to start living truly within your means is to pretend that your means are smaller than they are. A simple way to do this is to act as though you are still earning what you were earning before your last raise. Immediately put all extra money into a savings account (or use it to pay down your existing debt). For example, if you were earning $4000 per month before your last raise and now earn $4500 per month, you should put that $500 per month into savings and pretend that you don’t even have access to it. This will allow you to create an emergency fund while learning to live within your real means. The reason it works best to select a number that corresponds with an amount that you earned previously is because you already have experience living with that income. You know that you can make it work if you have to. Pretend that you have to. Make payments to yourself when loan payments are done. This is another trick for living with a certain “means” that you create for yourself. Let’s say that you’re spending $400 per month on a car payment. When the loan is done, continue pretending that the $400 is unavailable. You are already used to not having it to spend so this shouldn’t be very difficult. Instead of that $400 going to the car loan, though, it will be going into your savings account. This makes money available to you as an emergency fund in case something comes up in the future that would cause you to temporarily have to live beyond your current means. Use 30-day lists to prevent impulse spending. One of the best tricks for reducing your spending is to delay all purchases for thirty days after the day that you decide that you want to make the purchase. You can still purchase your regular items (such as groceries). However, when you see something else that you want, you make a note of it on your calendar. Go thirty days ahead, put the item on the calendar, note where it was and how much it cost and why you wanted it. Sometimes just trying to write down why you want the item will make you see that you don’t need it at all and then you can immediately remove it from the calendar and avoid the purchase. If that doesn’t happen, though, ignore the item until the thirty day date. At that time, reflect on the purchase and ask yourself if you still really want it. If you do, it probably has a place in your life and can be worked into your budget. In most cases, you won’t even want the item after thirty days have passed. Don’t buy anything that you can make yourself. The DIY revolution has been huge so many people are already making items themselves rather than paying to purchase them. For example, someone who crochets may make their own accessories rather than purchasing them. However, even those people who don’t consider themselves the DIY type can implement this rule. For example, you can certainly make your own lunch and dinner so why are you going out to restaurants instead? Before every purchase, stop and ask yourself if you can make the item instead. Do make sure to factor in the amount of time it would cost you to make the item since it is sometimes cheaper in the long run to buy an item than to spend excessive time making it yourself. Pay cash for everything. It is really, really tough for people to live within their means when they have easy access to loans through their credit card companies. It is so simple to just swipe that card and forget that you don’t have the money to pay for it when the bill comes due. Paying cash for everything eliminates this problem. Sure, there are some great benefits to using credit cards (especially cards that offer cash back rewards). However, until you truly learn to control your spending and live within your means, you’re just asking for trouble. Just pay cash. Are you successfully living within your means? What tips can you offer? I use the tip about ignoring your raise and making your budget equal to or less than the amount you used to live on in the past. I have found that tip to be very helpful and when things happen like now our taxes went up and reduced my salary…it did not bother me too much because I was already living on less. I notice that you mentioned spending in cash like that is the only way to live within your means and I have to disagree with you there. While it might be the better choice for the majority of people….there are some like me who manage our cards well and do better using credit cards for everything. I do not carry a balance and everything is paid automatically on my card, earning me cash back. Since I became debt free I have just been earning by using my card…and I have not been tempted to spend more just to earn bonuses. So the card only life CAN work for some people…..it just takes time and discipline. Never Buy Credit Card Debt Relief Upfront. On October 27th 2010, the Federal Trade Commission approved brand new laws and regulations which regulate the debt relief market and provides a lot more security on behalf of the purchaser. At this point debt settlement companies are banned from collecting in advance service fees. At present these debt relief programs must in fact settle the debt for the minimum of 35% as a way to gather a fee. This implies for those who have $40,000 in credit card debt and also the relief company is not able to eliminate at least $14,000 with the whole balance, you then don’t have to pay out anything at all. It would be a good idea to examine companies online prior to looking for a debt relief program. It could be a sensible idea to make use of a no cost credit card debt reduction network which will likely be capable to review all your possibilities in addition to evaluate the top end companies. The 3 principal possibilities for credit debt reduction are debt settlement, credit counseling, and debt consolidation. These networks will likely be capable to go over all your possibilities and present you a non-biased judgment on what alternative makes the most economic sense for you. A great way to get out of debt is to pick your highest interest debt, pay it off first, then use the amount you would have spent on that debt to pay off the next debt and so on until all your debts are paid off. You can find debt payoff calculators by searching on the Internet. This is basically what John Commuta teaches in his “Transforming Debt into Wealth” program. There. I just saved you several hundred dollars! Only use a credit card if it is securred. I have a $500 Credit card which is my own money. By making my payments larger than requested and paying 0n time it helps to build up your credit rating and makes you use the money sparingly and wisely. There is an interest charge , but it’s worth the effort in the long run.